The Postal Service has released its on-time performance reports for the fourth quarter of the fiscal year (July 1 – Sept. 30, 2015). Compared to the third quarter, on-time performance for most types of mail has improved, but performance remains significantly down from the same period last year (SPLY) — before the changes in service standards and operations at processing plants went into effect on January 5, 2015. For example, during the third quarter of FY 2015, single-piece First Class mail (SPFC) had an on-time performance record of 78.1 percent for 3-to-5 day mail. During the fourth quarter, 81.9 percent of this mail was delivered on time, an improvement of almost 5 percent. 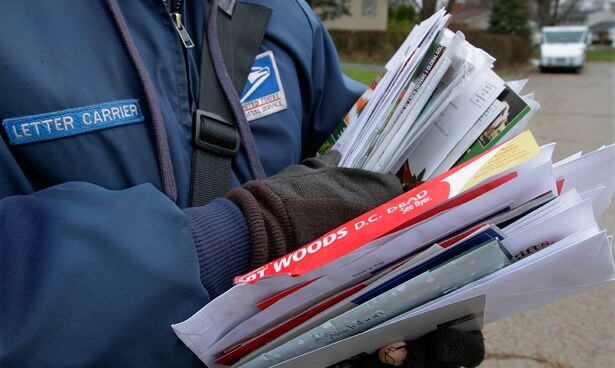 But compared to the same period last year, on-time performance for single-piece First Class mail with a 3-to-5 day delivery standard declined from 91.3 percent to 81.9 percent, a drop of 9.4 percent. That’s also well short of the target of 95.3 percent. As seen on this table comparing Q4 2014 and Q4 2015 for 3-to-5 day SPFC mail, the districts with the biggest drop were Triboro (23.8%), Caribbean (22.6%), Colorado-Wyoming (15.2%), Houston (13.7%), and Northern New England (13.1%). For presort First Class Mail with a 3-to-5 day service standard, performance is down from 94.8 percent for the SPLY to 91 percent for the fourth quarter of this year. Periodicals are down from 83.3 percent for the SPLY to 77.5 percent for Q4 2015. Periodicals and Package Services are also down from the third quarter, an indication that things aren’t getting better for all types of mail. This entry was posted in Downsizing USPS, General Union Business and tagged 2015 fiscal year, delivery standard declined, on-time performance record, performance is down, performance reports, reduced service standards for First-Class mail, save the post office, slow mail delivery. Bookmark the permalink.